Oil Painting Tutorial For Beginners - Paint What You See! Home » Oil Painting Tutorial For Beginners – Paint What You See! 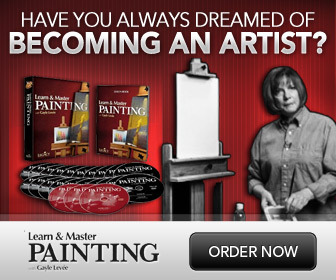 Oil Painting Tutorial For Beginners – Paint What You See! is a wonderful 5 part oil painting video tutorial by Artist William Gelvin that teaches how to paint what you see. This is a long video series, but well worth it. You will need about an hour of free time to watch this series. There are times when a beginner will paint what he thinks he knows about a particular subject and not what is right before his eyes. Now, this is not to say that you should always paint what you see exactly. Sometimes it is more important to paint what you know, especially if your eyes are not trained to see color and value correctly, as in a portrait for instance. In this oil painting lesson for beginners, William uses a subject that he has never painted before: a shiny gold watch. Shiny metal objects are probably one of the most difficult things for beginners to paint. That is because a beginner is not observing the watch correctly. William teaches you how to observe the watch differently, to break it down into a bunch of small shapes, which makes painting it much easier. Learn more by watching the videos below. Enjoy! A really big thanks to William Gelvin for sharing these videos. To learn more about William and to view more of his excellent video demonstrations and tutorials, follow this link to visit his YouTube Page. If you want to see some other instruction I have several videos of my work on youtube with work in progress.